What clues do archaeologists look for? How did Stone Age people make paint? "Paleolithic" is another word for the Stone Age. What did a Stone Age tool look like? Scroll down to the rock picture, click on the play button then click and drag a 3D picture of a Stone Age tool. How did people make tools from metal? When - and where - did the Olympic Games first start? What was life like for children in Roman times? How did people attack stone castles? Who wrote plays over 400 years ago and is still famous today? What toys did children play with over a hundred years ago? When were the first cars built? What were houses like during World War One? Where did people get their groceries a hundred years ago? 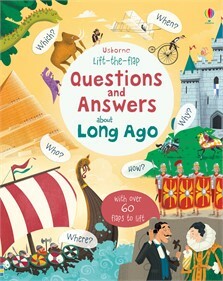 This is an essential book for the inquisitive young mind. [...] Perfect for primary children, this book is a welcome addition to the growing trend for high quality, informative, but fun, information books for children.